At Lucky Jiu Jitsu & Fitness Club we build our kids up to be champions in life! One of the ways we do this, is through our life skills program. Each month we go over the Life Skill: defining the skill, giving them examples, asking them to give their coaches examples, working on each Life Skill at home and school, and we also incorporate the Life Skill into our kids martial arts classes. This month we are learning along with Harry how to control our temper, and ignore the people or person who is trying to get under our skin. We are also going to learn to control our appetite for junk food and learn to walk away from the temptation. Parent Tip of the Month: This month show your child you have self-control by setting a goal to eat healthier and exercise.. Remember, you are your child’s FIRST role model. They want to be just like YOU! Be sure to demonstrate self-control in everything you do and every interaction with your children! 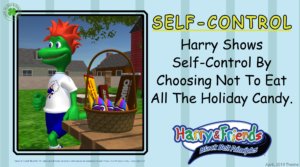 Here is a link with Harry and his Coach explaining Self-Control. What Benefits Do Martial Arts Offer That Team Sports Don’t? By teaching your child how to defend themselves, ether standing up and/or on the ground, we are teaching them the best forms of self defense. Without a doubt Muay Thai Kickboxing is the best form of stand up martial arts and Brazilian Jiu-Jitsu is the best form of ground martial arts. Most martial arts schools only focus on the stand up self defense or the ground self defense. At Lucky Mixed Martial Arts we specialize in both! We are always working to improve our curriculum to make sure your child is learning the best skills. At Lucky Jiu Jitsu & Fitness Club we believe in not only making champions in martial arts, we believe in making champions in life! Our programs are designed to increase your child’s confidence, self esteem, and help to make them a better person! Having your child involved in mixed martial arts will teach them discipline, respect, and self control. These necessary tools will help them throughout life, as well as avoid fights, and defend themselves when conflict in unavoidable. Instead of trying to “make the team” or sitting on the bench, everyone is able to participate. They are able to rank up (belt/strips), compete, and progress as an individual. Kids Martial Arts is one of the few sports where boys and girls can play/train together. Kids Martial Arts classes are one of the best ways for your child to get in shape and lead a healthy life. Unlike team sports, where a lot of kids sit on the bench, in martial arts training every child is pushed to make themselves better. This is very important in this day and age where kids just want to play video games. The workouts are fun and a lot of the time the kids don’t even realize they are exercising while they are learning self defense. Unlike team sports, which have seasons, they are able to train all year round! If you’re like the many parents whose kids take our martial arts classes… you don’t just want your child to learn self-defense. You want them to also learn respect, focus and discipline for a successful future. And you want them to get great exercise for health and wellness. Your child will get all of these and more in every one of our Southlake, Grapevine, Colleyville, Keller, Trophy Club, Roanoke kids martial arts classes. And our fun, expert instructors will be there to guide them every step of the way. Click here to learn more and enroll your child today. If you live in the following towns of Fort Worth, Southlake, Grapevine, Colleyville, Trophy Club, Roanoke, Lewisville, Coppell, Euless, Bedford, North Richland Hills, and Keller then you and children are close enough to come train with us!